Growing up near Boston, seafood was a regular part of my family’s dinner menu. 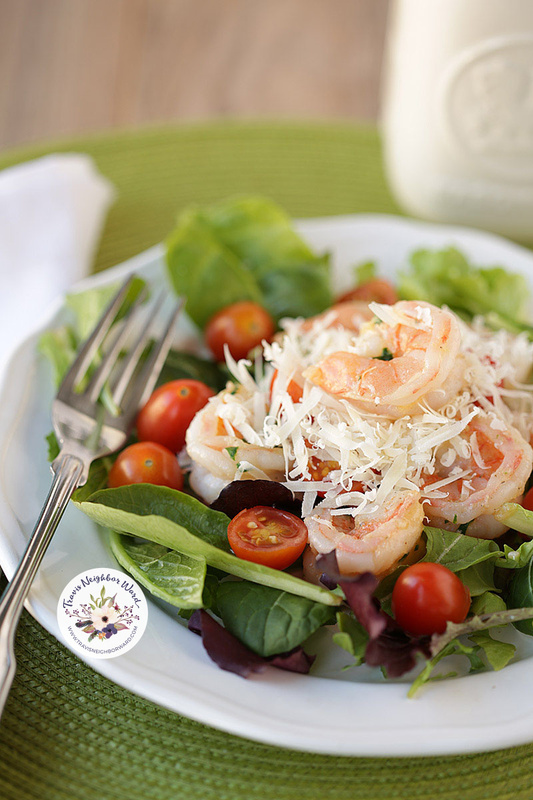 One thing I love about this shrimp salad recipe is that the cooked marinade on the shrimp combines with the freshly grated parmesan cheese to double as the salad dressing. That keeps it crispy and light, and you can really enjoy the varied textures of the greens that might otherwise be overlooked. I always make extra so I can have it for lunch the next day, which makes me feel a little spoiled because it’s so pretty! When I first started cooking shrimp, I used to take the time to remove the vein along the back. But it takes a long time to do it, so now I only remove it if I’m using extra large shrimp and the veins are extra large. (Truth be told: No one has ever noticed the difference.) My usual routine instead is peeling them and removing the tail before cooking them–that’s good enough. One thing to keep in mind when you make this dish: The consistency of the shrimp turns out best if you toss them into the oil when it’s already hot. This results in a somewhat crispy exterior and a plump, juicy interior. If you add the shrimp to the cold oil then heat them up together, the shrimp will still taste good but they won’t be so crisp on the outside. Also, you don’t need to use fresh shrimp; I use frozen all the time. If you do buy them frozen, defrost them by soaking them in a lukewarm bowl of water for about 15 minutes, switching out the water twice. Heat the oil in a large saucepan on low heat for one minute. Add the garlic and sauté until slightly cooked. Add the shrimp and parsley, and cook until the shrimp turns pink, about 5 minutes. Set aside to cool. Arrange the greens on a plate. Put the shrimp in the middle (including the cooked garlic pieces), surrounded by the tomatoes, and the parmesan on top in the center. Dribble any remaining olive oil on top and serve. 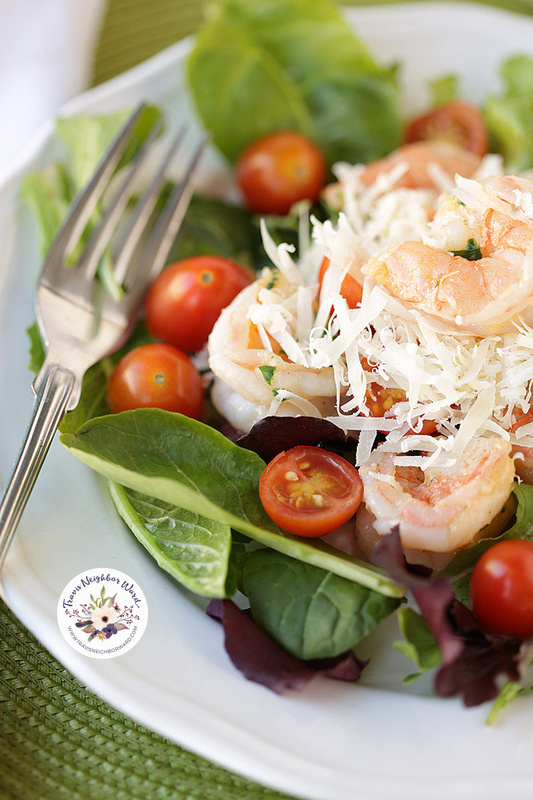 Let me know if you try this shrimp salad!